Spray evenly onto body and hair prior to sun exposure. Reapply frequently to maintain protectionespecially after sweating, swimming, or toweling off. Sun Filters: Protect the skin from UV rays and premature aging. Extracts of Gold Cob, Sycamore, and Aloe: Protect the skin from the drying effects of the sun and salt water. Organic Nyamplung Oil: Nourishes and beautifies the skin and hair. All skin and hair types. What it Is: A sheer, nutrient-rich mist that preps skin for foundation, finishes makeup and instantly refreshes the complexion for a healthy-looking glow. Paraben-free Sulfate-free Phthalate-free Mineral oil-free Vegan How To Use It: With eyes closed, hold bottle at arm's length and spray lightly over face. It's endless summer. 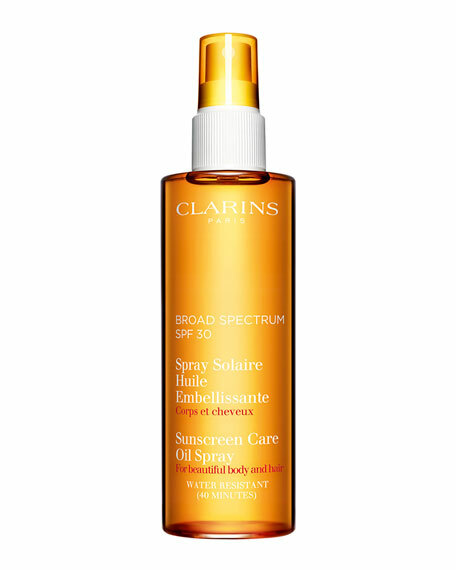 This super-luxurious shimmer spray helps revitalize and condition dull, dry skin. Helps tame flyaway hair, reduce frizz and enhance gloss and shine. Lightly scented with the seductive, sun-kissed Bronze Goddess Eau Fraîche fragrance. 50 mL/ 1.7 fl. oz.